Take a listen to some selected extracts and even download the liner notes! If you like what you hear and wish to purchase a copy, please select from the options below click the Buy Now option. For the UK the price is just £13.50 including P&P. For Europe, £16 including P&P and the Americas and Africa, £17 inc P&P. If you have any problems purchasing through Paypal, please get in touch. can also purchase directly from the Early Music Shop in London. To whet your appetite, or to read more about the music on the CD, why not download the electronic liner notes. You will need Adobe Acrobat to open the file. FAQ – Here are some questions people have asked me. Why record a CD? Isn’t everything online these days? Maybe it is, but it’s not always easy to find what you want online. I’m not sure the two are exclusive. The analogy I make is with food. Sometimes we want to grab ‘n’ go and satisfy our instant hunger, but that doesn’t mean we don’t also wish to take time to enjoy the experience of eating. A CD is a three course menu with descriptions and pictures. A few selected tracks are on Youtube and the liner notes are even available to download below for those who want instant access on the go, but hopefully there is still a little joy to be had unwrapping the cellophane, taking out the CD and thumbing through the notes. Just solo recorder? Nothing else? Yes, well, six different recorders to be more precise… Practically and financially it made sense as this project was planned and funded by me and me alone. But musically, I liked the idea of putting the recorder centre stage. Echoes of Arcadia? What does that refer to? It occurred to me that the recorder is desperate to be seen as a modern instrument with a contemporary voice, yet its identity, associations and even part of its appeal is that it has such a long and rich history. One or two composers have completely disassociated the recorder from its past, but many have chosen to reflect some aspect of this in their music, perhaps the subject matter, the musical form, or even a real piece. It was this idea of past associations that I wanted to explore. I’ve heard of Bach and Telemann, but who are all these others? Ah, the joy of playing an instrument that lay dormant for 150 years, thus escaping the attentions of many of the most famous composers. I wanted to step away from a CD devoted to one composer or genre and find something that didn’t appear to be on the market. Now, it might be that it isn’t on the market for a reason, but hopefully I have found a little commercial corner to occupy. The sleeve notes tell the whole story, but there are one or two interesting links not mentioned. Van Eyck was a fellow blind recorder player and so has a special place in my affections and admirations. Holland is perhaps even more important today than in Van Eyck’s time as a centre for recorder study and Andriessen’s contribution is as great as any in the Dutch school. It was while studying Musica Inquieta with composer Markus Zahnhausen in 2009 that he eluded to his great respect for Telemann, so this pairing seemed very appropriate. But what about actual echoes? Whilst observing a master class given by Dan Laurin in 2012, I came across Annette Ziegenmeyer’s Delay Flute for the first time. Though perhaps not the most profound musical expression to have been inspired by the recorder, there is a rhythmic vitality and sense of unashamed joy that I find infectious in Na Zdrowie. It also completed the circle and the idea for this recording project thus was sewn. I see there is a piece by you on this recording. I didn’t know you were a composer. What else have you written? First things first: I am not a composer and have absolutely no formal tuition in the art, though I do have several seeds of ideas for other works which need time, energy and technical refinement in order to flower. Lullaby and Lament started life as a structured improvisation to fill a gap in an Advent recital at my wife’s theological college. This is an area which has taken my interest since joining the Paraorchestra in 2011 and Tactile in 2015, improvisation that is, not theology. The version performed here retains much of the original material with some additions. Improvisation was a prized skill in the Baroque period and this piece is my own homage to Van Eyck’s facility in this area. Do you have plans for any more recordings? I am working on plans for a recorder and organ disc with my longtime collaborator and keyboard genius Trevor Hughes. This is not a common pairing for obvious reasons, but actually the timbre of the recorder can blend very successfully with the organ. We have a number of transcriptions in preparation to complement favourite works by Handel and Bach. We are also hoping that there may be a new composition for the recording, watch this space. 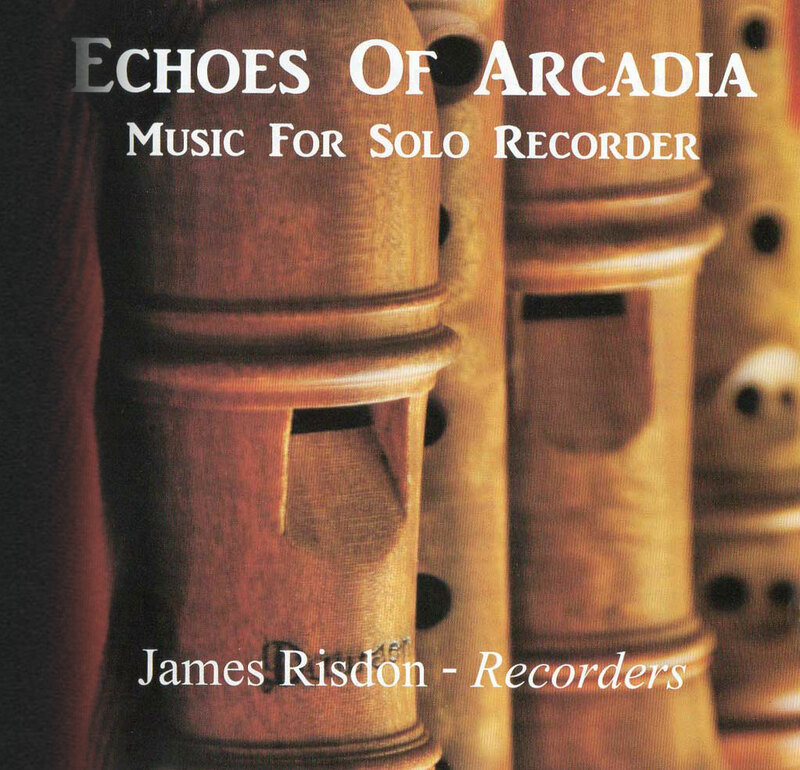 Risdon communicates the solo recorder’s sonority, versatility and virtuosity brilliantly. I am so pleased with your excellent and moving interpretation of Medieval Nights. Your performance of 20/21st century music is outstanding. What an interesting and fascinating CD from an extremely talented and skilful musician. You capture very well the mystery and tranquillity of The Extatic Shepherd. Absolutely exquisite in all ways, technically and musically. In particular, the beauty of the sound is out of this world. A thing of absolute beauty – we had it on the other day when some mates came over, and everyone just stopped talking and listened …. it’s that good. James’ flawless virtuosity and deep musical soul combine to create an unusually satisfying and exceptionally rewarding musical journey.